Garua is Spanish for mist, and is also used to describe the weather conditions that persist for several months of the year in the Galapagos. The garua results when warm air masses move over the cool Humboldt Current, causing moisture to condense out of the atmosphere. During El Niño years, the garua is replaced by heavy rainfall. Even during the warmth of day, the mist persists at high elevations, although lower elevations may be dry. 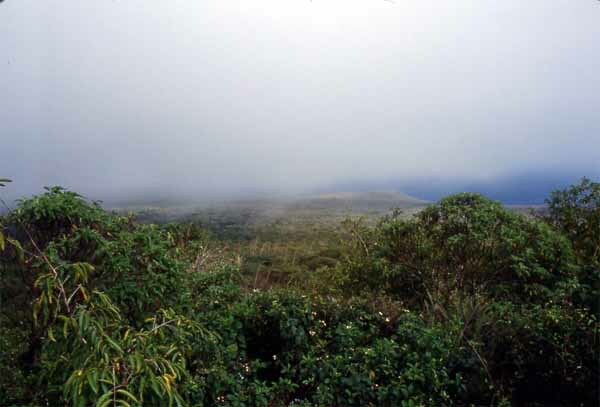 In this image, the top half of the picture comprises the cloud-like mist, which condenses on the green vegetation (foreground), whereas lower down toward the ocean (middle right), the air is clear.